As with many ancient foods, the history of sushi is surrounded by legends and folklore. In an ancient Japanese wives’ tale, an elderly woman began hiding her pots of rice in osprey nests, fearing that thieves would steal them. Over time, she collected her pots and found the rice had begun to ferment. She also discovered that fish scraps from the osprey’s meal had mixed into the rice. Not only was the mixture tasty, the rice served as a way of preserving the fish, thus starting a new way of extending the shelf life of seafood. Funa-zushi, the earliest known form of nare-zushi, originated more than 1,000 years ago near Lake Biwa, Japan’s largest freshwater lake. Golden carp known as funa was caught from the lake, packed in salted rice, and compacted under weights to speed up the fermentation. This process took at least half a year to complete, and was only available to the wealthy upper class in Japan from the ninth to 14th centuries. At the turn of the 15th century, Japan found itself in the midst of a civil war. 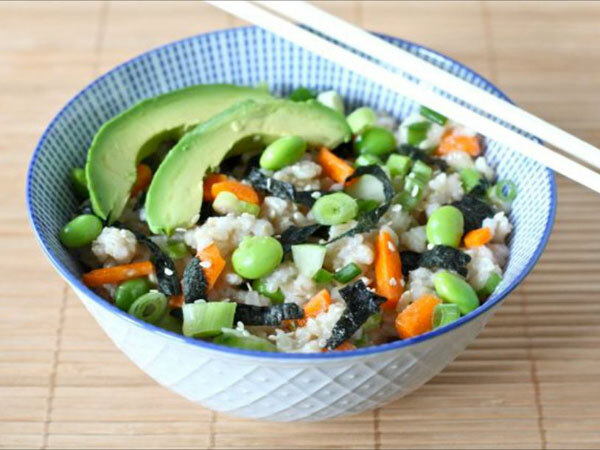 During this time, cooks found that adding more weight to the rice and fish reduced the fermentation time to about one month. They also discovered that the pickled fish didn’t need to reach full decomposition in order to taste great. This new sushi preparation was called mama-nare zushi, or raw nare-zushi. In 1606, Tokugawa Ieyasu, a Japanese military dictator, moved the capital of Japan from Kyoto to Edo. Edo seemed to undergo an overnight transformation. With the help of the rising merchant class, the city quickly turned into a hub of Japanese nightlife. By the 19th century, Edo had become one of the world’s largest cities, both in terms of land size and population. 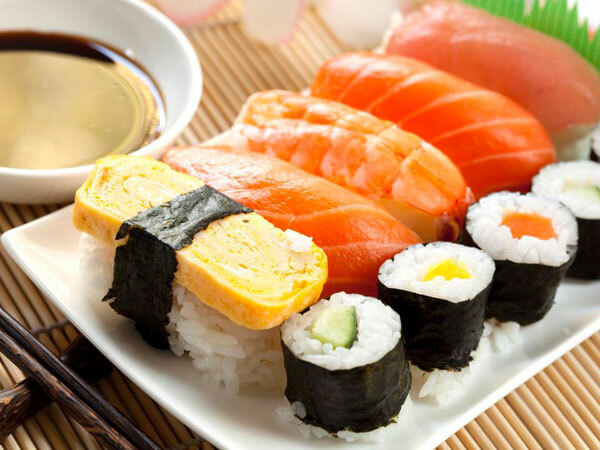 In Edo, sushi makers used a fermentation process developed in the mid-1700s, placing a layer of cooked rice seasoned with rice vinegar alongside a layer of fish. The layers were compressed in a small wooden box for two hours, then sliced into serving pieces. This new method greatly reduced the preparation time for sushi… and thanks to a Japanese entrepreneur, the whole process was about to get even faster. In the 1820s, a man named Hanaya Yohei found himself in Edo. Yohei is often considered the creator of modern nigiri sushi, or at the very least its first great marketer. In 1824, Yohei opened the first sushi stall in the Ryogoku district of Edo. Ryogoku translates to “the place between two countries” because of its location along the banks of the Sumida River. Yohei chose his location wisely, setting up his stall near one of the few bridges that crossed the Sumida. 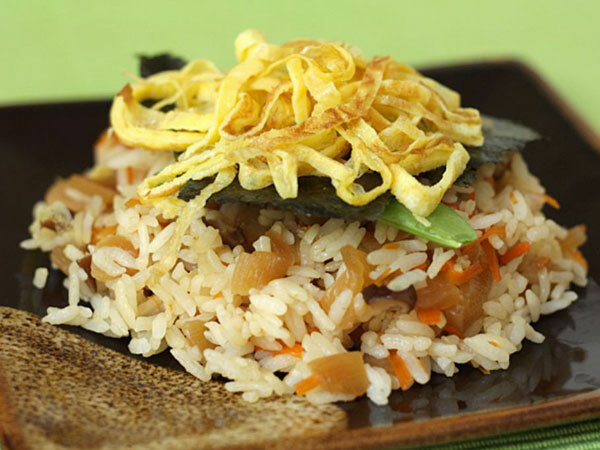 He took advantage of a more modern “speed fermentation” process, adding rice vinegar and salt to freshly cooked rice and letting it sit for a few minutes. He then served the sushi in a hand-pressed fashion, topping a small ball of rice with a thin slice of raw fish, fresh from the bay. Because the fish was so fresh, there was no need to ferment or preserve it. 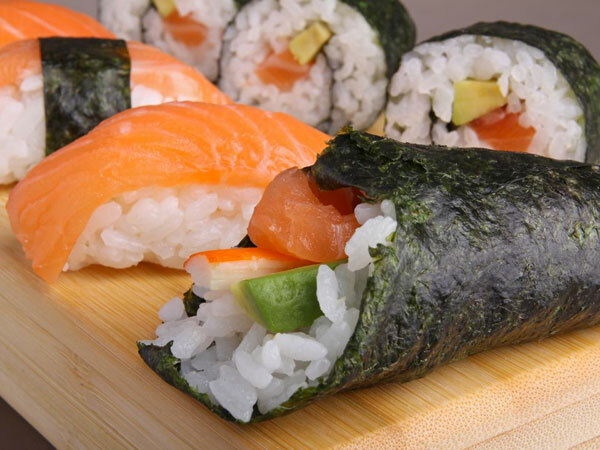 Sushi could be made in a matter of minutes, rather than in hours or days. Yohei’s “fast food” sushi proved quite popular; the constant crowd of people coming and going across the Sumida River offered him a steady stream of customers. 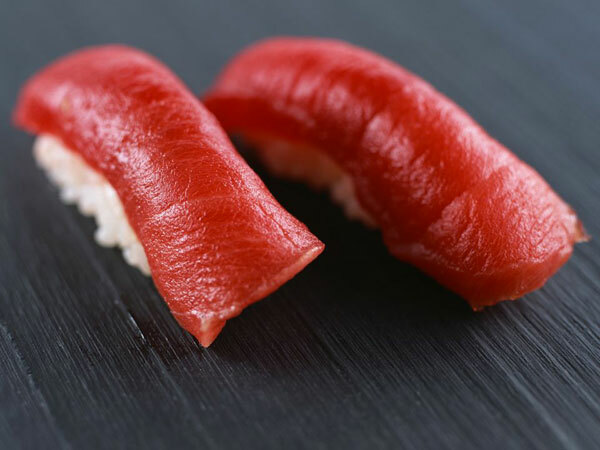 Nigiri became the new standard in sushi preparation. By September of 1923, hundreds of sushi carts or yatai could be found around Edo, now known as Tokyo. When the Great Kanto Earthquake struck Tokyo, land prices decreased significantly. This tragedy offered an opportunity for sushi vendors to buy rooms and move their carts indoors. Soon, restaurants catering to the sushi trade, called sushi-ya, popped up throughout Japan’s capital city. By the 1950s, sushi was almost exclusively served indoors. In the 1970s, thanks to advances in refrigeration, the ability to ship fresh fish over long distances, and a thriving post-war economy, the demand for premium sushi in Japan exploded. 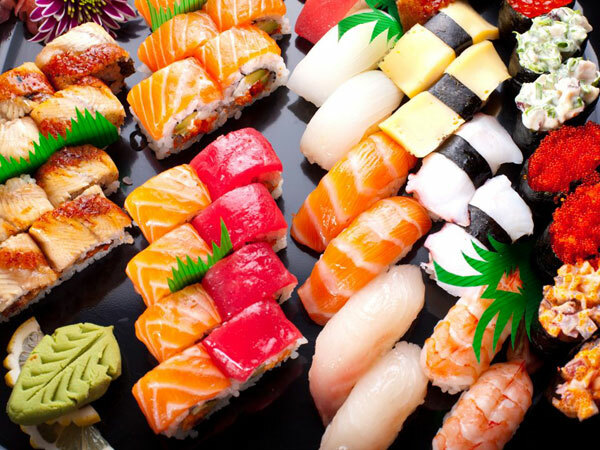 Sushi bars opened throughout the country, and a growing network of suppliers and distributors allowed sushi to expand worldwide. 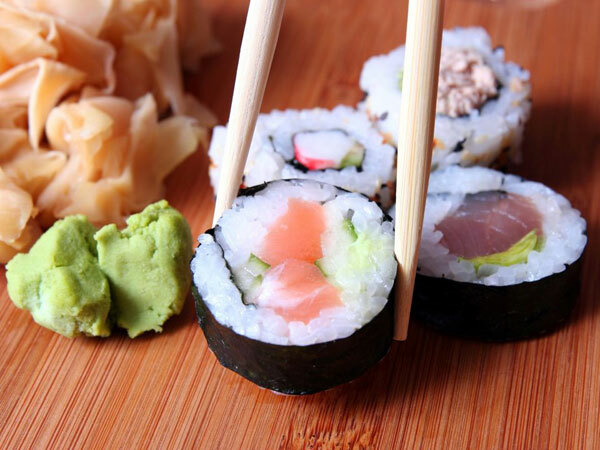 Los Angeles was the first city in America to successfully embrace sushi. In 1966, a man named Noritoshi Kanai and his Jewish business partner, Harry Wolff, opened Kawafuku Restaurant in Little Tokyo. Kawafuku was the first to offer traditional nigiri sushi to American patrons. The sushi bar was successful with Japanese businessmen, who then introduced it to their American colleagues. In 1970, the first sushi bar outside of Little Tokyo, Osho, opened in Hollywood and catered to celebrities. This gave sushi the final push it needed to reach American success. Soon after, several sushi bars opened in both New York and Chicago, helping the dish spread throughout the U.S.
Sushi is constantly evolving. 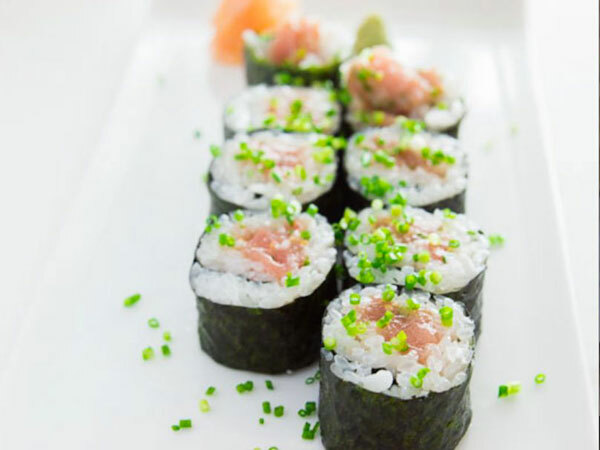 Modern sushi chefs have introduced new ingredients, preparation and serving methods. Traditional nigiri sushi is still served throughout the U.S., but cut rolls wrapped in seaweed or soy paper have gained popularity in recent years. Creative additions like cream cheese, spicy mayonnaise and deep-fried rolls reflect a distinct Western influence that sushi connoisseurs alternately love and disdain. 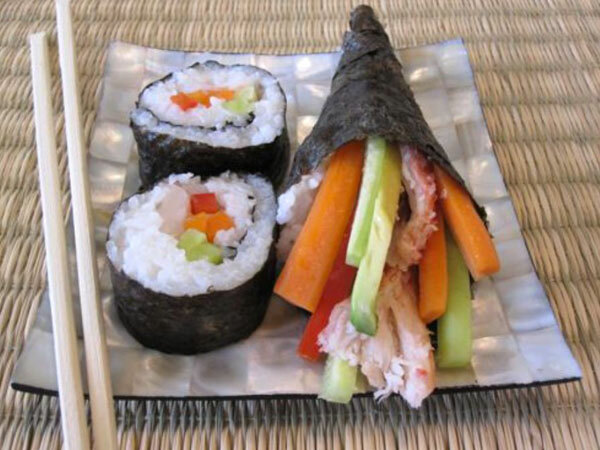 Even vegetarians can enjoy modern vegetable-style sushi rolls. Have you ever tried making sushi at home? Here are five sushi recipes from some of my favorite sites and food blogging friends. Even if you can’t stomach the thought of raw fish, modern sushi chefs and home cooks have come up with all kinds of fun variations on the sushi concept. 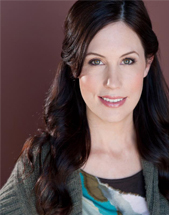 From traditional to modern to crazy, there is something here for everyone! 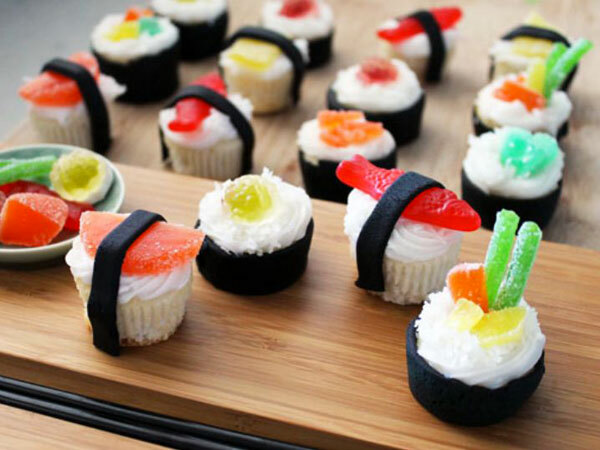 Sushi Cupcakes, anybody? Corson, Trevor (2008). The Story of Sushi – An Unlikely Saga of Raw Fish and Rice. Harper Collins Publishers, New York, NY. Issenberg, Sasha (2007). The Sushi Economy – Globalization and the Making of a Modern Delicacy. Gotham Books, New York, NY. Mouritsen, Ole G. (2009) Sushi: Food for the Eye, Body and Soul. Springer Science + Business Media B.V., New York, NY.